100 affordable apartments will be included as part of the massive 500 unit complex. 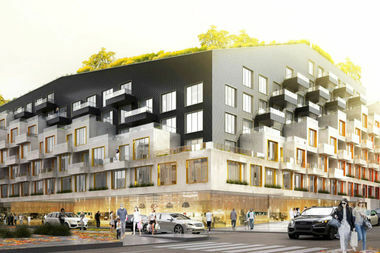 BUSHWICK — A developer at the controversial Rheingold brewery site pledged to set aside a fifth of the units for subsidized housing, settling a bone of contention with housing advocates, according to an agreement with the city filed on Tuesday. Of the 100 subsidized apartments there are 32 studios, 54 one-bedrooms, 14 two-bedrooms, according to the agreement made with the city's Department of Housing Preservation and Development. Studios will rent at $913 a month, one-bedrooms will rent at $980 and two-bedrooms will rent at $1,183 all for earners who make around 60 percent of the area median income, which is an average of $54,360 for a family of four, $48,960 for a family of three, $43,500 for a family of two and $38,100 singles. Fifty four of the apartments will be one-bedrooms, according to the agreement. Construction is well underway at 10 Montieth St., being built by The Rabsky Group, co-owned Simon Dushinsky. It's slated to be finished by summer of 2018, according to the developer. The lottery for the affordable apartments will begin in late 2017. 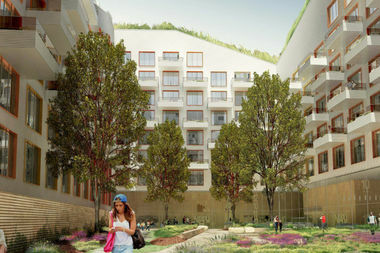 The another portion of the Rheingold site, designed by the same architect, ODA New York, but built by All Year Management, has also said it will build 20 percent affordable apartments, or around 160 apartments, at part of its complex. The news that Rabsky would commit to building at least 20 percent affordable apartments at the site, came as a small relief to community housing advocates who've been worried for months about the future of the site. "At least something's something," said Edwin Delgado, a member of the community group tasked with overseeing issues at the Rheingold site. "I always get the feeling these developers find a way to get around everything. This is definitely good." Their fears stem from the fact that Read Property, the former owners of the entire Rheingold site and the ones who made pledges to the community about affordable housing there, later divided the property up and sold it off to Rabsky and All Year; and many worried that the new developers wouldn't uphold the deal made by a different developer. The 10 Montieth St. development will include a cornucopia of amenities including a gym, yoga studio, squash courts, climbing wall, library, pet spa, roof gardens, sun deck, amphitheater, and bocce court, according to the Rabsky Group.In exchange for the 100 affordable apartments, the Rabsky Group will get a floor bonus to build more apartments through the city's Inclusionary Housing Program, according to HPD, though the developers could earn further tax breaks if they apply for the the controversial 421-a tax break, which they are eligible for.